I had never given cranberries a second thought, including the cranberries served at Thanksgiving. I always thought of them like parsley... they're on the plate to look pretty, but they're nothing special. And for most of my first forty-something Thanksgiving dinners, the cranberries were either my grandmother's standard homemade tart cranberries with orange (and my grandmother was the "Queen of Garnish", so sitting center and proudly among the cranberries would be a rose that Gramma made out of the orange rind, and then she would dip the tips in food coloring), or the gelled cranberries that you slide out of a can. 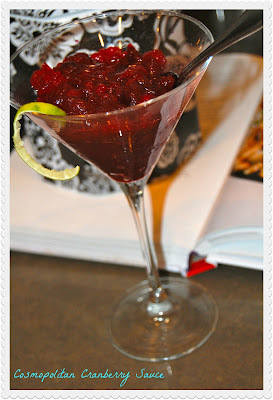 And then about 10 years ago a friend told me her cranberry chutney is a hit, and oh so easy. I found the chutney to be interesting, filled with a variety of dried fruits, ginger, pepper and balsamic. I must say it appeared to be a hit wherever i brought them, or so i thought. Last year i showed up with my cranberry chutney only to find those round, jiggly slices from the can on the table. Nobody would admit to not liking my chutney, but this year someone suggested i might want to do something simpler. I decided to search for a special cranberry recipe, otherwise i knew the cans would make a reappearance. 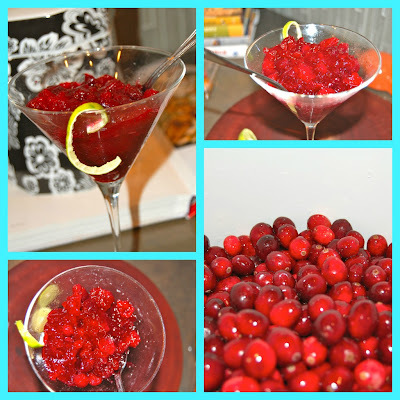 These cosmo cranberries (named after the famous and delicious drink) were a hit when i tried them at my office. However, I would think twice before making these if there are small children or recovered alcoholics at our dinner. Or people driving! Yes, they're made with vodka, and a lot of it, and the liquor does not get cooked out. In fact, the original recipe called for 1/3 cup of vodka but i reduced it to 1/4 cup. My sister thought it could be reduced even further. I say live wild and see who winds up dancing on the table! Perhaps these cranberries will create some everlasting Thanksgiving memories. In a heavy mediums saucepan over moderate heat, combine the cranberries, sugar and water. Bring to a boil, stirring often to dissolve the sugar. Then, reduce heat to moderately low and simmer, stirring often, until thickened and reduced to about 3 cups -- about 15 minutes. Transfer to a medium bowl and cool, stirring often, until tepid, about 30 minutes. Refrigerate until chilled and set – at least 2 hours. This should be served either chilled or at room temperature. Yields about 3 cups cooked. Buon appetito, and happy Thanksgiving!